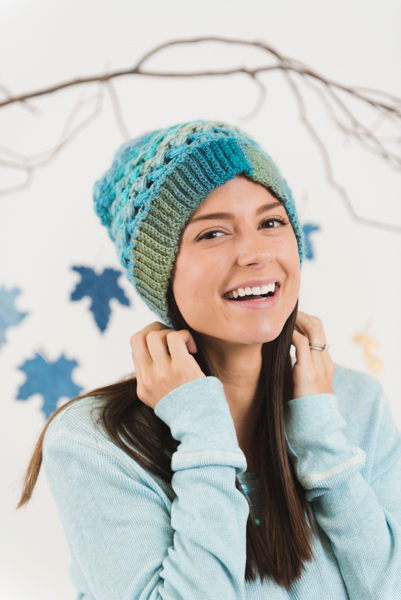 Shades of crisp, icy blue make this slouch hat a must have for that cold transition from fall to winter. 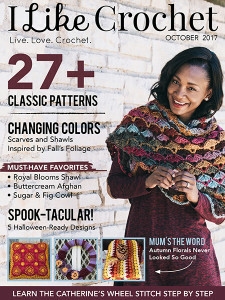 The design also features the puff stitch, which is a great way to add texture and to spice up your regular stitches. Puff Stitch: (Yo, insert hook into previous row between first and second dc in 3-dc group, yo, draw up a long lp) 3 times (7 loops on hook), yo, draw through first 5 lps, yo, draw through remaining 2 ls on hook. With smaller hook, ch 11. Row 1: Sc in 2nd ch from hook and each ch across, turn – 10 sts. Row 2: Ch 1, sc blo in each ch across, turn. Rep Row 2 until piece meas 21” from beginning, ending with a WS row, join with sl st to first row. Rnd 1: Ch 1, working on long side of Ribbing, sc 105 sts evenly around – 105 sts. Rnd 2: Ch 3 (counts as dc), dc in next 2 sc, *ch 2, sk next 2 sc, dc in next 3 sts; rep from * to last 2 sts, ch 2, sk last 2 sts, join with sl st to top of tch. Rnd 3: Ch 4, *sk next 3 dc, 3 dc in next ch-2 sp, Puff Stitch in skipped 3-dc group, ch 1; rep from * to end, join with sl st in 3rd ch of tch, turn – 21 Puff Stitches. Rnd 4: Ch 4, *sk next 3 dc, 3 dc in ch-1 sp, Puff Stitch in skipped 3-dc group, ch 1; rep from * to end, join with sl st in 3rd ch of tch, turn. Rep Rnd 4 until piece measure 11” from beginning. Fasten off, leaving a long tail. Thread through Puff Stitches and ch-1 sps and pull tight to close. 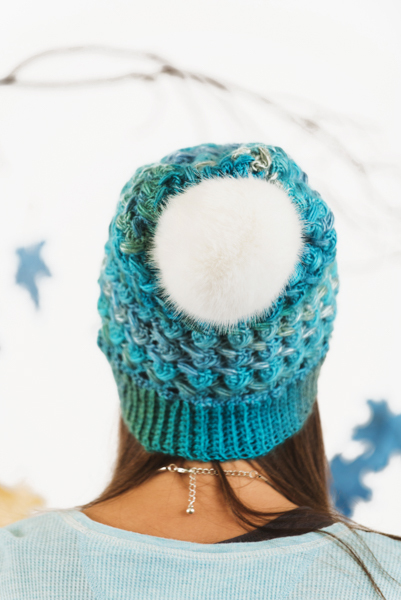 Sew pom-pom to top of Hat.